Measures up to 6 channels of particle sizes plus air temperature and relative humidity. Used for capturing videos and photos that are stored onto internal memory or a micros card. 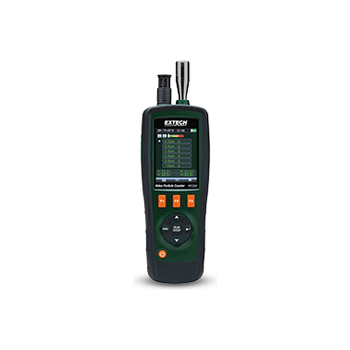 The VPC300 can measure up to 6 channels of particle sizes plus air temperature and relative humidity. Use the included software to generate reports with videos, photos and data points. Complete with NIST-traceable calibration certificate, Universal AC Adapter/Charger with multiple plugs, USB cable, PC software, tripod, filter, 7.4V NiMH battery and a hard, protective case.